I was so thrilled to get to read this book. Joanell and I share the same publisher, WiDo Publishing, and it made me proud to know that I am in such great company with this talented writer and exceptional novel. This is my first book review and I truly enjoyed the experience. I hope you enjoy the review and learning more about Joanell Serra. Below the review you’ll find her bio and all the info for buying her book. Much like a glass of rich, full-bodied wine, The Vines We Planted by Joanell Serra is a treasure for all your senses. I thoroughly savored every moment I spent in the Sonoma wine country with Serra’s cast of real-to-life characters as they traipsed through the challenges of their lives. From the opening moments of the book, I found myself pulled in easily, wrapped up in the saga, and caring about Uriel, Amanda, Jim, Elena, and all the other well-developed characters. As a writer/author, I often find myself examining the craft and style of the writing as I am enjoying a book, much like my son, who is studying to be an actor, watches a play through different eyes. 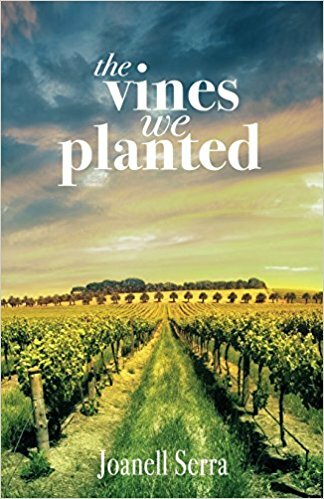 In The Vines We Planted, I was amazed by all the delicious layers of this talented writer and storyteller. The writing is seamless and beautifully descriptive without being overly detailed. Every scene is easily visualized and felt through Serra’s brilliant imagery and word choice. In addition, she has a knack for getting inside the mind of her characters, making them come alive with distinct and relatable personalities. I loved the themes in the book and could feel Serra’s experience as a therapist shining through as she deftly illustrated the ups and downs of family drama and the deep effects it can have on people. The book delved into family secrets, love affairs, heartbreak, and the resiliency of the human spirit. I also enjoyed getting a glimpse into the way of life and the environmental beauty of the Sonoma area. The Vines We Planted interweaves the lives of families from different walks of life, giving us a chance to learn about the varying classes and immigration challenges in the area. I also loved the “behind-the-scenes” look at the winery business and it left me wanting me to know even more about life among the vineyards. I highly recommend The Vines We Planted! It’s the perfect summer read and it’s ideal for book clubs. I can already imagine having my book club over to discuss it while I serve up some great Sonoma wines. The Vines we Planted is a warm, heartfelt, sumptuous journey that pairs well with the red or white of your choice. I am so glad to hear that Serra is already working on her next book because I can’t wait to read more from her.